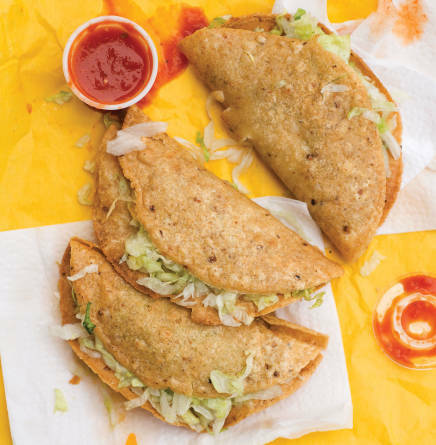 Patricia Greathouse, a native New Mexican food journalist, waxes eloquently and enthusiastically about this style of taco (at left), which she remembers from the dearly departed La Cocina café in Española. The proprietor, Mrs. Martinez, took pity on Pat and told her how to make them herself. One of the secrets was Kitchen Bouquet, a bottled savory condiment that food stylists use today to make food a richer brown. You can substitute soy sauce or tamari if you wish. Heat a large skillet over medium-high heat. Add the beef and cook until it is uniformly browned. Break up the meat as it cooks, adding the onion when the meat has lost its raw color. When the onion turns translucent and begins to brown, add the garlic, potatoes, Kitchen Bouquet, salt, and enough water to cover the potatoes and meat. Bring the mixture to a boil, then lower to a simmer and cook for about 10 minutes. If the potatoes aren&apos;t tender by the time the water cooks out, add a little more water. When the potatoes are tender, let the meat-and-potato mixture brown in the pan. It will stick as it browns. Turn the mixture several times, scraping up the browned bits that stick to the pan and breaking the mixture up into small pieces. When the potatoes have broken up and the filling has lots of browned flavor, add more salt if you wish. Keep the filling warm. For taco shells Heat at least 1 inch of oil in a large skillet until the oil ripples. With tongs, dunk a tortilla in the oil long enough for it to go limp, a matter of seconds. Don’t let the tortilla turn crisp. Repeat with the remaining tortillas and blot them with paper towels. Fill a tortilla with about 2 tablespoons of filling, fold in half, and secure with a toothpick. Repeat with the remaining tortillas and filling. Raise the temperature of the oil to 350°. Fry the tacos, in batches, until lightly browned and crisp. Drain well. Remove toothpicks and garnish with cheese, lettuce, and tomato. Serve with salsa and enjoy right away.